Material:Stainless steel. It is easy and safe. eCheck will be held until cleared. We will reply you ASAP. Color: photo color. W e support wholesale. the picture may not reflect the actual color of the item. Due to the difference between different monitors. The color of the website's photo and the actual item could be slightly different. 10 X Belly Button Ring. Material:stainless steel & alloy & crystal. It is easy and safe. eCheck will be held until cleared. Quantity:10 pcs(10 styles, 1pcs each style). Size: Length: 4.4cm. Material:316L surgical stainless steel. It may be longer. Lenght about 2cm. W e support wholesale. Material:316L surgical stainless steel. Color: Randomly send. The color of the website's photo and the actual item could be slightly different. the picture may not reflect the actual color of the item. It may be longer. Color: Randomly send. We only accept. 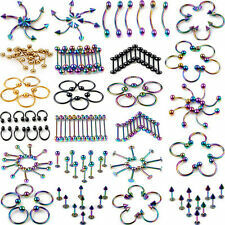 Quantity: 100pcs,10PCS FOR EACH STYLES. Ball size:5mm ball with 3mm dia of crystal; 3mm steel ball. Ball size:4mm ball with 2mm dia of crystal. Ball size:6mm ball with 4mm dia of crystal; 5mm steel ball. Material: Silver Plated rhinestone. Bar thick: 1.6mm. Bar length: 10mm. Also note that monitor settings may vary from computer to computer and may distort actual colors. 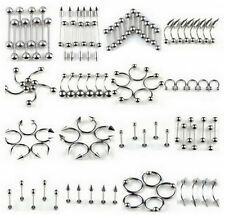 Quantity: 85pcs per lot Material: 316L Surgical stainless steel NOTE: You may receive the body jewelry like The ball/Spikes..is apart from the bar, but it is no harm to the usage. You can screw them on, because of the long time delivery, they are screw out. NOTE:This item come without retail box. 1: 1 Inch=2.54 CM; 1 CM=0.39 Inch. 2: Due to different producing batches, there may be deviation of 2----3 CM for items. Quantity: 10pcs. The color of photos may vary from different monitor. We also try our best to show the material in a color that is as close as possible to the original, all our photos are made using light that is as close to natural as possible and avoid color variation.